Heat grill. Cut four 18x12-inch pieces of Reynolds Wrap® Heavy Duty Foil. 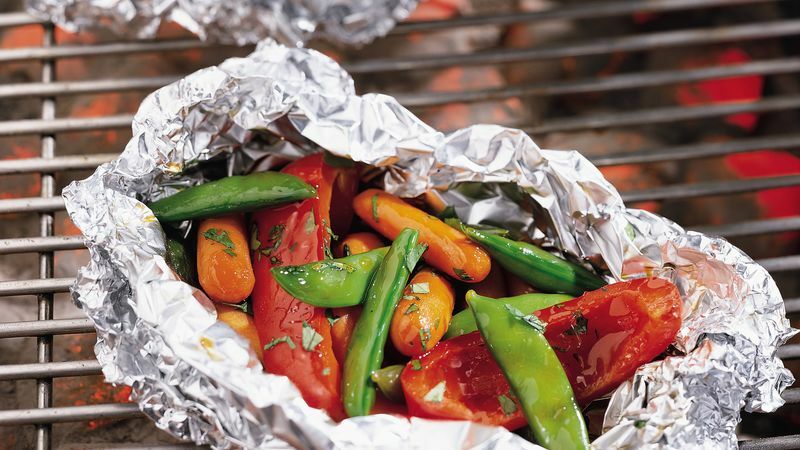 Place carrots, sugar snap peas and bell pepper in center of each piece of foil. In small bowl, combine teriyaki baste and glaze and ginger; mix well. Drizzle mixture over vegetables. Wrap each packet securely using double-fold seals, allowing room for heat expansion. When ready to grill, place packets, seam side up, on gas grill over medium heat or on charcoal grill 4 to 6 inches from medium coals. Cook 15 to 20 minutes or until vegetables are crisp-tender. To serve, open packets carefully to allow steam to escape. Sprinkle each with cilantro.